"Science is whatever we want it to be." -- Dr. Leo Spaceman, in a 2007 episode of "30 Rock." 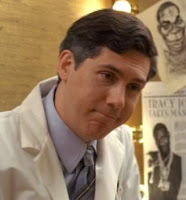 The celebrity doctor -- listed under fertility, meth addiction and child psychiatry in the Writers Guild Health Manual -- is a recurring character played by actor Chris Parnell. One of the best parts of sharing office space with the St. Petersburg Times' Washington team has been talking with bureau chief Bill Adair about PolitiFact.com -- the news site that he conceived and created at the start of last year's presidential campaign cycle, and that he is now nurturing into the first year of the new administration. Now that the Florida newspaper has become the first to collect a Pulitizer Prize for national reporting that appeared primarily on the Web, journalists should be carefully mapping Bill's DNA to try to figure out what his creation suggests about journalism's future. But this was Bill's vision. I remember when PolitiFact was just an idea that he crudely illustrated on the kind of three-panel cardboard backdrop commonly used to display middle school science experiments. The plan was ambitious -- perhaps even unsustainable, as I warned Bill two years ago, especially during a demanding and fast-moving election year. Did Bill metamorphose into a Webslinger by organizing large projects this way, or were his neurons and synapses just wired that way from the larval stage? Either way, he began building PolitiFact with the right editorial mindset. He did not start with an assumption that he needed to post scrolling pages of long-form text or beautifully shot and edited video or audio just to take what he was doing seriously. He set out to build a Web site. This mindset was reflected in the underlying structure of PolitiFact. The site's core from the start was its Truth-O-Meter, which allowed users to sort its collected fact-checking by subject, speaker or ruling (true, mostly true, half-true, barely true, false and the dreaded "Pants on Fire!"). PolitiFact later added a "Flip-O-Meter" (with scores ranging from "no flip" to "full flop"). And the three-month-old "Obameter" was added just before January's inauguration to track roughly 500 specific campaign promises that Barack Obama made during his campaign. The promises are organized by subject and by status (from promises kept to promises broken, with other steps in between, including no action at all). And throughout the site, the PolitiFact team has meticulously listed and, whenever possible, linked to the sources on which they were basing their conclusions. Plenty of other good sites take this approach to organizing content, particularly online services that provide news and information on finance, sports, weather, traffic, entertainment -- topics that perhaps more obviously lend themselves to the approach. But few apply this multilayer, user-directed model to other bread-and-butter journalism beats, such as local news, national news, foreign affairs and politics. The data-driven political blog FiveThirtyEight was -- and is -- a good example of a more dashboard-like approach to organizing daily news. CQ Politics, PolitFact election-year sister's site, also did this to some degree with its continuously updated race ratings for the electoral college and all the 2008 congressional and gubernatorial contests -- a feature that was prominently displayed throughout the site, but that was still second to the day's this-just-in, headline-driven coverage. The navigational approach/mindset I'm describing is much more common in project-based journalism. One of the most impressive examples is "13 Second in August," a Minneapolis Star Tribune special report presented with a scrolling aerial shot of the 35W bridge after its 2007 collapse. Clickable numbers on each smashed and abandoned vehicle take visitors to the stories of the occupants, using a combination of text and multimedia. Could this approach work to covering breaking news -- say, for instance, day-of coverage of a disaster on this scale? Absolutely, as public radio station KPBS did using frequently updated interactive maps during the 2007 wild fires in San Diego. But pulling off such coverage means that, from the very start, editors and top producers need to think about how their reporting and information is organized -- not just how to get it or the order in which it was received. I learned that at washingtonpost.com overseeing our overnight coverage of the presidential and vice presidential debates in 1996, 2000 and 2004, when we embedded a small, sometimes animated "Debate Referee" to serve as our fact-checker throughout each transcript. Clicking on the referee opened a window that had a short bit of text on the veracity of a candidate's claim and links to other articles and off-site resources that provided more information and explanation. I warned Bill about the challenges we faced cranking out our quadrennial Debate Referee boxes, many of which benefited significantly from the traditional, long-form fact-checking articles produced each debate night by teams of reporters in the Post's print edition newsroom. Turning that kind of work into a day-in, day-out operation for the 18 months leading up to election day did not sound sustainable to me when Bill first started explaining his idea for PolitiFact. But he was undaunted and his enthusiasm was infectious. With his Science Project cardboard chart in tow, he convinced his editors in St. Pete to devote considerable resources to an editorial experiment they believed in. One of the most shrewd decisions Bill and his editors made was to choose their niche. While driven in part by competitive reality, the choice to focus their online election coverage almost entirely on vetting the statements of the 2008 presidential candidates distinguished the site's content from the more ephemeral enterprise of chasing campaign polls, ground movements and other tactics. That focus also linked their site to a number of noble but generally under-appreciated editorial progenitors. The tradition of "truth squading" took on greater urgency among political journalists two decades ago, after the fact-twisting TV ads of the 1988 White House race. That's when columnist David S. Border (my first boss at the Washington Post) began urging his colleagues in political journalism to "become more like consumer reporters," systematically scrutinizing the content of campaign commercials -- the dominant form of political communication at the time. As David put it in a 1991 speech, these "ad-watch" stories would help voters "decide what was true and what was false in the advertising, what was real and what was distorted." The Post and many other news organizations, national and local, print and broadcast, joined in David's cause. One such notable journalist was Brooks Jackson, a longtime Washington reporter for the AP and Wall Street Journal, who created the template for on-air "ad-watch" and "fact-check" segments on CNN in 1992. Brooks later continued that work online on FactCheck.org, an ongoing project of the Annenberg Public Policy Center of the University of Pennsylvania. Bill has often tipped his hat to Brooks and his FactCheck'ers -- even as he was building upon and revolutionizing how this kind of journalism was organized and presented. PolitiFact certainly missed opportunities, too. The site provided prominent feedback links, but few ways for users to publicly engage the editors and each other -- a conscious and debatable decision, intended at least in part to help differentiate the site from becoming just another place for partisan name-calling and bickering. But being interactive means being available to interact. The site also needs a business model -- something Bill and his editors are keenly aware of. I was very happy to see an ad on the site just a moment ago that was paid for by one of the major "advocacy" advertisers that help underwrite other politically oriented Web sites and publications. That's a start. More High-Speed Rail: Was 'Supertrain' Just Ahead of Schedule? 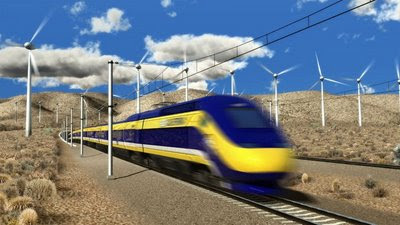 Trains for America's Pat Lynch posted a nice link to my CQ column on high-speed rail. However, Pat was not amused by my impertinent references to NBC's failed 1979 TV series "Supertrain." "Come on, Mark," he wrote, "give us a break over here!" Apologies, Pat. Readers of this blog probably are used to my interest in finding links between technology policy and pop culture. In this case, I had a hunch: Most of the folks who even remember "Supertrain" are probably the same people who -- like me, to be honest -- always had a certain fascination with the concept of high-speed rail. The show in fact refers directly to this kind of person in its two-hour debut. In the opening scene, a blustery, gray-bearded executive -- played by character actor Keenan Wynn -- explains that he has the backing of the federal Transportation Department to quickly build a new "atom-powered, steam-turbine" train "capable of crossing this country in 36 hours." The executive's cigar-chomping board of directors is skeptical, if not hostile. "I think you are letting your psychotic fascination with railroads lead you into a suicidal gamble with the future of this company," one board member says. Funny enough, this opening exchange pretty well sums up most of the public policy arguments about high-speed rail in this country, both before and since Supertrain's short, nine-episode run on network TV. "Much of the public policy discussion centers on the emotions of hard-core 'raifans' and greedy corporate interests. The great trains of the 1940s are dead and gone forever, but America still needs passenger trains for business and personal travel. So far, airlines, highways, and trucking special interests have monopolized the debate. Interstate highways are an essential part of our transportation system, but that's obvious. Air travel is convenient and cheap. Reliable trains ought to be an option for intermediate length trips and under-served rural areas. Americans should enjoy the same travel options others nations take for granted"
So how does the fictional version of the debate between the "hard-core 'raifans'" and the "greedy corporate interests" play out? The first 10 minutes of the "Supertrain" pilot are posted on YouTube (and embedded below), just in case you want to see that scene for yourself -- or get a quick sense of how cheesy the rest of the series turns out to be alas. Despite all that, I'll confess: I was a fan (and even enjoyed double-checking my memories of the show against this tribute site). Adapted from my "Futurist" column in the April 20 issue of CQ Weekly. One of the most expensive flops in television history was "Supertrain", a show about a 200-mile-per-hour, nuclear-powered locomotive -- a landlocked "Love Boat" with celebrity guest passengers, fancy special effects and elaborate sets, including a disco worthy of the program's snappy theme song. NBC aired only nine episodes back in 1979, far from enough to land "Supertrain" in rerun heaven. But at least in the world of slow-moving public policy, the show has been in continuous syndication. Since Japan's first Shinkansen "bullet train" debuted 45 years ago, U.S. officials, advisory panels and even some private ventures have tried to get high-speed rail lines rolling in this country. With the exception of Amtrak's Acela Express, which has run at top speeds of 150 mph between Boston and Washington for nearly a decade, all those efforts have taken the same brief one-way trip to cancellation as NBC's fictional train. Does all that budgeting and legislating mean conductors will soon be welcoming American passengers aboard glitzy new levitating passenger cars, ready to zip them across magnetic tracks at hundreds of miles per hour? Not so fast. Bolder investments in genuinely advanced service are still on the table, with detailed plans expected later this year. But an in-depth analysis issued last month by the Government Accountability Office raises questions that might be daunting enough to send even the most vocal high-speed rail advocates to the "quiet car" to think. (PDF: full GAO report). Even with all the recent 10-figure authorizations and appropriations, the biggest obstacles to the fastest rail options still seem to be the same ones that derailed many past efforts: politics and economics. The political questions are obvious enough. Super-fast trains are big-ticket, long-term projects that will require sustained support through many administrations and legislative regimes -- and not just at the federal level. States and localities will have significant responsibility and authority, too, which is why the stimulus law gave those governments new flexibility to borrow for rail projects that aim to move passengers at 150 mph or faster. Cooperation across jurisdictional lines will be key, especially in places that will need extended rights of way to build dedicated new tracks. That could be politically tricky in some of the most congested areas, where potential demand for faster rail service might justify the investment. The investment is itself a significant challenge. As the president put it when he unveiled his high-speed rail plan last week, the $13 billion already requested amounts only to a "down payment." Whether that down payment pays off hinges in part on demand -- a notoriously elusive metric, the GAO notes, since estimated ridership depends on such unpredictable factors as energy costs, ticket prices, convenience and reliability. Cost overruns also can throw off the math. Even if the demand is there, the capital may not be. The money for high-speed rail is coming from general funds, making it subject to continuous jostling with other budgetary priorities. The GAO cautions that private investors might be reluctant to shovel in cash without a dependable source of sustained public funding. Given the challenges, how do Asian and European countries pay for their high-speed trains? The GAO found that fast rail systems in France, Spain and Japan are generating sufficient passenger revenue to cover ongoing expenses but not the cost of building the systems in the first place -- an expense officials in those countries justify for environmental or other societal reasons. "In the countries we visited, the central government generally funds the majority of up-front costs . . . without the expectation that their investment will be recouped through ticket revenues," the agency's report said. It's not that European and Asian countries are more willing to subsidize big transportation initiatives than the United States is. It's that U.S. subsidies tend to favor other modes of transportation, particularly roads paid for with taxpayer money -- much of it in the form of government borrowing -- and air travel, a consistently profit-challenged business that depends heavily on public infrastructure, services and tax breaks. If all the train talk in Washington signals a real change in policy, especially in terms of political and financial expectations, Supertrain might in fact be ready to roll. All aboard? Image above: A conceptual rendering of a high-speed train passing through California's Tehachapi Pass created by Newlands & Company (NC3D) for the California High-Speed Rail Authority.